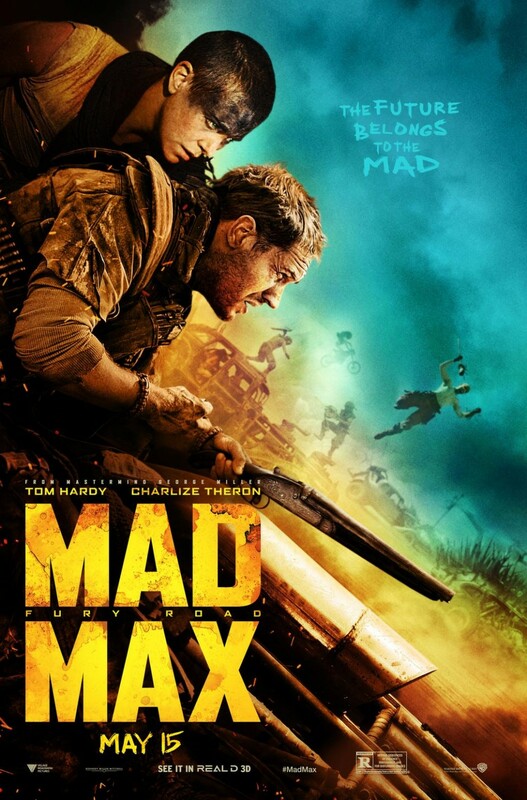 From the moment you hear Tom Hardy’s “Max Rockatansky” croak out the words ‘My world is fire and blood’ you know you are in for a monumental whirlwind of a ride as the world of ‘Max Max:Fury Road’ unfolds on the screen before you. What follows will have you feeling as though you’ve been sucker punched in the gut, but in all the right ways. I left the theatre breathless and two hours later I still don’t think I was breathing properly. It’s been three decades, 1985 to be exact, since we last saw the Road Warrior known as Mad Max, then being played by Mel Gibson, and from minute one-this film is a methane-fueled thrill ride that only gives you a minute or two to breathe in between the non-stop, rollercoaster post-apocalyptic relentless action of this return trip to the world of George Miller’s MAD MAX. 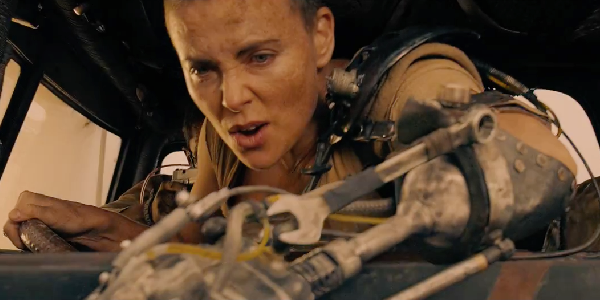 And yes, Charlize Theron as one-armed “Imperator Furiosa” just absolutely kills it. She’s the immovable object AND the irresistible force at the same time. I mean when was the last time you had a such a woman of action, and one armed to boot. Never. Her death-stare is truly like a thousand war-engines revving up. Axle grease used as war paint. Every man’s doom as her and Hardy have one of the screen’s most powerful man-on-woman fights and at no moment does one ever think that Theron/Furiosa is at a disadvantage against him as her opponent. Max’s inner demons are what haunts him this time round. He’s lost his wife and young daughter and it’s that little girl’s flashbacks accusing him of failing to save them that keeps appearing to haunt this guilt-feeling Max to the point that he lets his guard down just enough to get captured by “Immortan Joe” (Hugh Keays-Byrne) the over-lord of the citadel in this futuristic bleak wasteland, who dispenses precious water to his followers (quick shoutout to the California drought here ha!) all the while raising a troupe of ghoulish young men called the “War Boys.” The Boys, thinking Valhalla awaits them when they die so they can commit heinous crimes on Joe’s behalf. 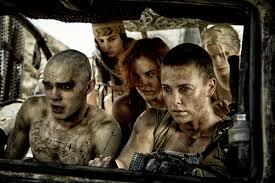 What drives this films plot is when Furiosa decides to go off course with an Immortans War truck along with his best five breeders aka wives “Toast the Knowing” (Zoe Kravitz), “The Splendid Angharad” (Rosie Huntington Whiteley), “Capable” (Riley Keough), “The Dag” (Abbey Lee) & “Cheedo the Fragile” (Courtney Eaton) to make it back to her childhood home ‘The Green Place’. Joe sends his War Boys after her including “Nux” (Nicholas Hoult) who just happens to have his ‘human blood bag’ aka Max strapped to the front of his vehicle in a chase scene that can only be described as sheer motor madness. There is not one but three different factions chasing them at times in the the most crazy of action sequences as we go from car chases to fist fights to foot pursuits and then we go back and do it all over again. It’s like the spin cycle of the washing machine is going full blast and giving us with perfect timing, a few moments here and there to catch our breath. Neither Hardy nor Theron speak much through the first 30 minutes as they are to focused on just surviving. 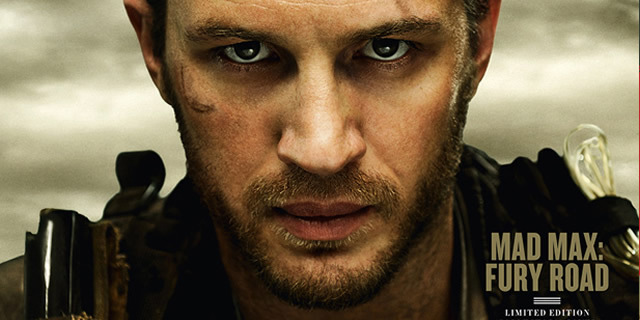 Hardy in yet another voice not his own, only really gives us a few grunts in the first hour, so Theron’s Imperator Furiosa seems almost chatty patty in comparison. 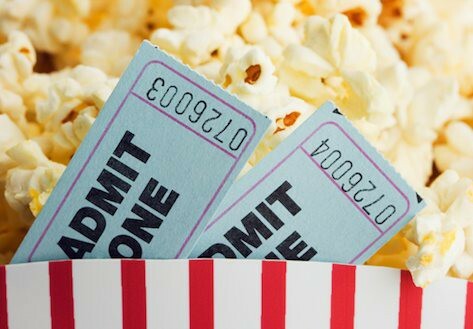 As I don’t want to give away the whole plot as what I’ve described is really only the first 15 minutes or so of the film and it’s something that just must be seen spoiler free for yourself. And not on DVD or your laptop or your phone..you NEED to watch this in all it’s glory as it’s meant to be seen, on the biggest screen available to you with loud booming sound or you will miss even the crazy maniacal guitarist that would make even the biggest speed metal fan need earplugs as he plows along the desert in pursuit with Joe. Trust me on this one. I would be remiss if I didn’t mention two things to end with here. One: the #GirlPower in this film is truly something to behold. Every single female character holds their own and I give huge kudos on this. 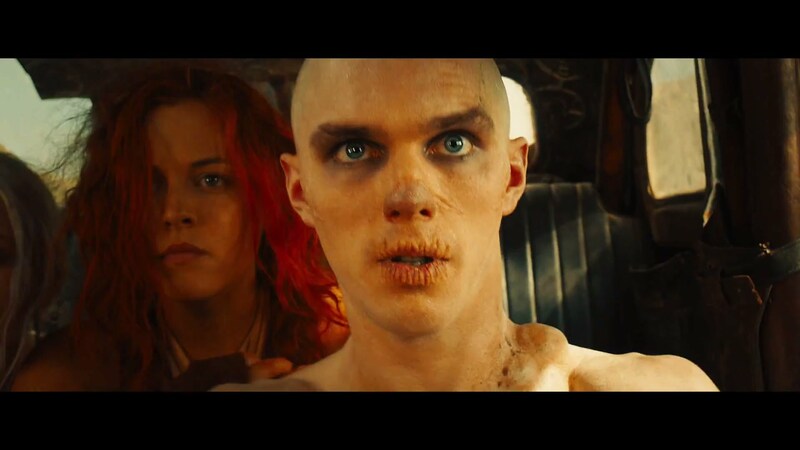 Two: George Miller with this film simply raises the bar on everything cinematic being released thus far this year. CGI might be great for the Marvel or X-Men and it IS all fun and good, but there is NOTHING like the mastery brilliance that can take the place of watching live action human element of feeling as one – riding along with chainsaw wielding madman sliding across car hoods, crawling on the outside of fast moving vehicles or fear of being plucked out of said moving vehicles by crazed maniacs swinging from high velocity poles. It’s absolutely brilliant and made me giddy throughout the whole movie. I heartily agree. Any studio with a lot of money can put on a CGI fest these days. It takes a visionary like George Miller to present action in a style that propels the medium further. It’s essential that every automotive monstrosity in Mad Max: Fury Road is a physical entity that exists. The danger is real. 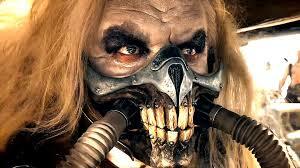 What do you think the odds are of Mad Max receiving any of the prestigious Oscar nominations? I’d love to see it get Best Picture and Best Actress nods, but I just don’t see that happening. Maybe a chance for Best Pic. but that’s iffy considering the script was a little weak and it’s early in the year still. It will probably get a lot of behind the scenes awards that it will wholly deserve! Charlize would be an AWESOME nom though rriiigghhtt??!!! yes i saw that yesterday! It would be a shame if it DIDN’T snag a BP nomination, considering where it’s ranking on Rotten Tomatoes is. (98% currently). No doubt the snobs in the Academy won’t “get” the film (they’re the 2%, I’d say) but it would be nice to see a film that entertains so purely get at least a nod. Indeed! It will almost certainly get nominations for editing, sound mixing, production design and costume design. Music – perhaps (it’s a bit Zimmery). And maybe Hoult (maybe) as Best Supporting Actor. With you on all counts!!! Theron’s performance, in an action movie of all movies, is one of the best I have seen in a while. She does indeed kill it, her performance (and obviously the insane action) is what makes me wanna go see this again! It does make you wonder who would have starred in this if Miller had been able to make it back in the 90s. As it is, the 30 year wait was worth it. Good point. Tho these days there are heaps of Aussie actors making names for themselves… It woulda been uber cool if say… Guy Pearce had played Max. Now that would have made the film a 5/5 for me!!! Yeah that is a good call, I didn’t know about the sequels… also didn’t realise Pearce was that old. I still reckon he’d nail it but… yeah I get where you come from, he wouldn’t bring as much energy as someone ten years younger. Oh Peg, you had me at “crazy maniacal guitarist”. Can’t wait to see this one!! IT … IS … AMAZING!! !